In 1850 John Finan and his family settled at Flat Rock a mile and a half north of present day Payne, Ohio. Four years later the second catholic family moved into the district, the family of Charles Harth. Two years later there followed the first German family that of Theobold Lothamer. One year later, 1857, the little colony increased with the arrival of the three Brady brothers: Michael, Peter and Simon. Over the next seven years two more Catholic families moved to the area. These families assembled on Sunday and recited the rosary and other devotions. A dozen old Butler catechisms were secured from Boston for the instruction of the children. Priests visiting on horseback from Defiance and Delphos met the sacramental needs of this small community only on occasion. By the close of the Civil War “Pucker Brush” with a post office known as Malottville, now Payne, had grown to be a thriving village and many Catholics settled in and around it. It was deemed best to build the church in the village. It was Reverend Alfred E. Manning, a resident pastor of Antwerp, who served Payne as a mission, who with the permission of Bishop Gilmore of Cleveland began the construction of the church in Payne. The building served the congregation until the present church was built in 1902, and the old church was remodeled and used as the first school. An interesting story is told about how the parish was named. “When the Catholic men of Flat Rock met to select a name for the new parish, two of the leaders had already, in their own minds, chosen the name.” Peter Brady wanted it named St. Peter’s and John Finan wanted it named St. John the Baptist. “They finally decided to ‘flip a dollar’ heads wining. John Finan won. From these humble beginning St. John the Baptist has grown to a parish of 688 souls, making available the only Catholic Grade School in Paulding County with classes K – 6, a rectory, Catholic Cemetery and Parish Hall. 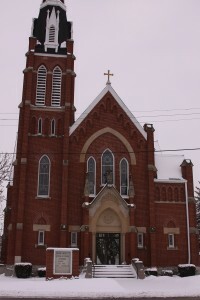 As of 1999 St. John’s became a sister parish with St. Joseph in Paulding, Ohio sharing a common pastor. On July 1, 2008 the parish was suppressed and Divine Mercy Catholic Parish of Paulding was established. Its history is just beginning.